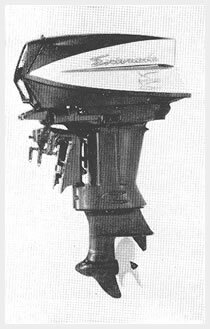 Two New Evinrude 75-HP. V-42 lead this manufacture's 1961 line which also includes the 40-hp. Lark III, 40-hp. manual-starting Big Twin, 18-hp. 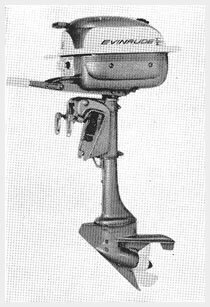 Fastwin, 10-hp. Sportwin, 5.5-hp. Fisherman and 3-hp Lightwin. All but the smallest have forward-neutral-reverse shift and thermostatic temperature controls. The 40 and 75-hp. motors are equipped with automatic chokes. All V-4s have Jetstream Drive lower units designed for hydrodynamic efficiency. For greater fuel economy, 40 and 75-hp. 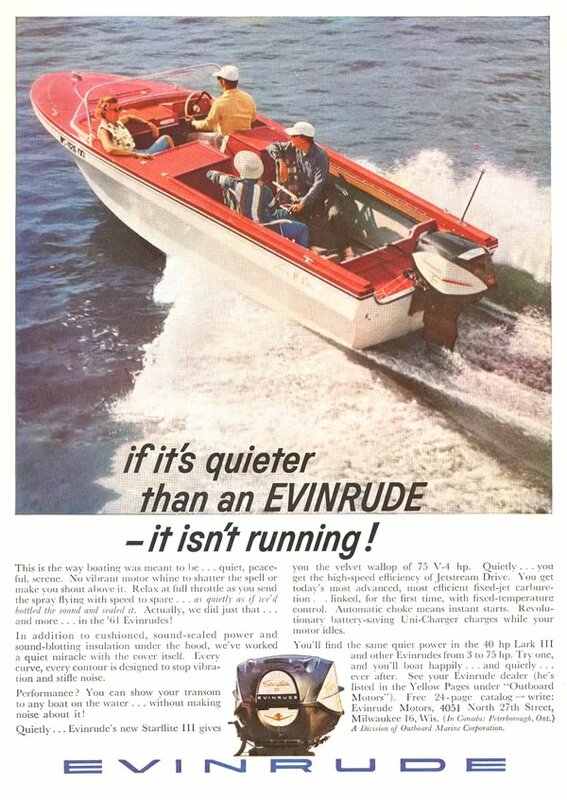 Evinrudes provide fixed-jet carburetion. This replaces adjustable high speed needle valves. A high capacity a.c. generator on the luxury model of the Starflite III begins to charge at idling speed and rapidly increases its output to 20 amperes. Regulation of current flow to the battery is accomplished by a transistorized voltage regulator. This Uni-Charger Starflite III has automotive type battery ignition. Jetstream styling by Brooks Stevens is aimed at the elimination of flat "talking" surfaces and abrupt angles replacing them with vibration-free sound diverting curves. Further sound reduction is attributed to the use on Lark III and Starflite III models of cellular sound absorbent lining in the motor covers. All 1961 Evinrudes incorporate new principles in bearing design at points of major stress. Electric-starting models have fully-sealed wire harnesses with the quick-disconnect located inside the junction box for better electrical connection. Stern brackets on 10 and 18-hp. models provide wider clamp openings for heavier boat transoms. Electric starting models have temperature warning dash lights while the Uni-Charger version of the Starflite III is equipped with a light to indicate that the switch is on. All V-4s have two-way stock absorbers and provision for starting while in gear at low speed throttle settings.